Combining IVCAD's Vector-Receiver Load Pull measurement methodology in conjunction with AMCAD Engineering's patented "source impedance matching method and system" (US patent US8269508B2), Maury Microwave is pleased to introduce MAGIC SOURCE PULL. Because the a- and b-waves of the DUT are measured at the DUT reference plane, it is possible to measure the large signal input impedance of the device. With this information and through a patent-pending technique, it is possible to simulate the effect of matching the source of the device without having ever varied the source impedance. This "virtual source matching" is highly reliable at even extremely mismatched conditions, and allows for simulated source contours to be drawn. 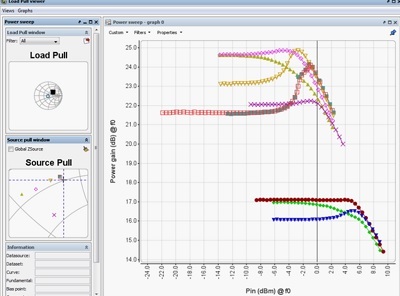 Trade-offs between maximum gain, efficiency and other parameters can be viewed in real-time without multiple source pull load pull iterations. 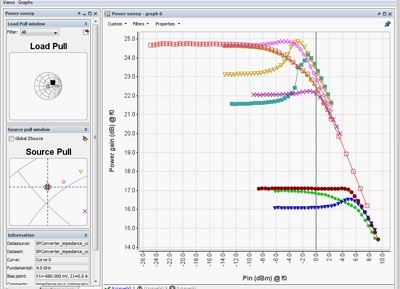 IVCAD advanced measurement and modeling software, offered by Maury Microwave and AMCAD Engineering supports multiple load pull techniques including traditional load pull using external instrumentation, VNA-based load pull, active load pull and hybrid load pull. It performs DC-IV and pulsed-IV measurements and incorporates device modeling tools. Its modern visualization capabilities give users a greater ability to view, plot and graph measurement data in an intuitive manner. Need information regarding IVCAD Magic Source Pull?